Belief in God does not lead to a linear or one dimensional view of life. Rather it may lead to the concept of immortality, but not in the sense we normally equate with Heaven and humans. God, I believe, encompasses the entire universe, not solely our small, insignificant world for the benefit of mankind. To say God is just for us comes, I feel, from a mindlimited by immediate need. Why have we been so fearful of exploring the past completely, openly, scientifically and without fear? Have we simply been afraid of upsetting some of our convenient and complacent ideas…ideas we were taught to accept without question and without proof ? Let’s ponder possibilities and begin by exploring a few avenues of the past. Consider the Piri Reis map. This was a pre-modern world map compiled in 1513 from military intelligence by the Ottoman-Turkish admiral and cartographer Piri Reis. It clearly shows the contours of North and South America and Antarctica in correct relation toEurope and Africa to such an extent that, when placed side by side with a modern space image, they are virtually identical, even to the distortion caused by the fact that our earth is round. Charles Hapgood (1904-1982) wrote three books including Maps of the Ancient Sea Kings (1966). Research resulted in his belief that the Piri Reis map supported his theory of global exploration by a pre-classical undiscovered civilization. The reason? His analysis of the mathematics of ancient maps and of their accuracy led the professor to determine the Piri Reis map surpassed instrumentation available at the time of its drafting. This opens a few doors beyond what we have been taught. Does it not? One example from the Old Testament is the story of The Flood. God tells Noah to build an Ark. God is going to cause a flood that will destroy all living creatures, but He makes a covenant with Noah. Along with his family (including his extended family), Noah is to bring two of every species of animal as well as a supply of food. Then, except for Noah and all with him on the Ark, the earth returns to the way it was before ‘Creation.’ God lets loose the waters of chaos. The story tells that God thought human violence had corrupted the earth. It had spoiled His creation. So God had to destroy not just humankind, but the earth as well. All, that is, except Noah and the Ark. Then God makes a wind blow and the waters begin to subside. Dry land reappears and the earth is repopulated with birds, animals, reptiles, and human beings, all descended from the Ark. Similar events can be traced to Hindu scriptures written centuries before the Bible. 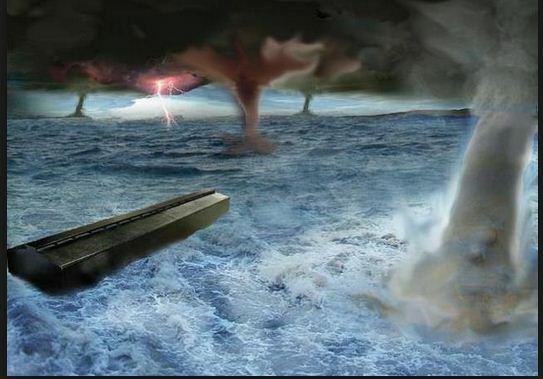 Also the Babylonians who claimed that their God Cronus foretold the Flood to Sisithrus who built an Ark. At some point, Sisithrus sent out three birds to determine if the flood had subsided. The birds, passing over an unbounded sea, found no place to rest and returned. But on the third trial, the birds came back with mud on their feet leading Sisithrus to land his ark on the mountain Armenia. It was later, after the so-called deluge, that gods were replaced by mortals on the thrones of city-states. Plato also gives an account of the Flood and the city of Atlantis in the dialogueCritias. According to Critias, in ancient times the Earth was divided among the gods by allotment. Atlantis was allotted to Poseidon, the god of the sea, storms, and earthquakes. Poseidon fell in love with a mortal girl who bore him a number of children, the first of whom was named Atlas. He inherited the kingdom and passed it onto his firstborn. This lasted for many generations. For many generations, while the god’s strain in them was still vigorous, they gave obedience to the laws and affection to the divine whereto they were akin. However, eventually the Atlanteans became corrupt. …when the god’s part in them began to wax faint by constant crossing with much mortality, and the human temper to predominate, then they could no longer carry their fortunes, but began to behave themselves unseemly. To the seeing eye, they now began to seem foul, for they were loosing the fairest bloom from their most precious treasure; but to such as could not see the true happy life, to appear at last fair and blessed indeed, now they were taking the infection of wicked coveting and pride of power. On the North American continent, the Nez Percés Indian Tribe of the Palouse, an area southwest of what is now Spokane, Washington, also has a flood story in which the only humans who survived did so by climbing the mountain Yamustus (which means Holy Mountain) that is in Steptoe Butte. The rock, by the way, that forms the butte is over four hundred million years old. Was Homer’s Odyssey inspired by The Epic of Gilgamesh mentioned above?Gilgamesh, described as “Two thirds they made him god and one third man”lived about 2700 BC. He was named in the Sumerian King List as the fifth King of the first Dynasty of Erech after the Flood. His reign was said to have lasted 126 years. (His son reigned a mere thirty years and thereafter, kings reigned in ordinary human terms.) Could it be that the “part-divine and part-human” means the possibility of an offspring from the mating of an earthling with an intelligence from outer space? After all, the primitive mind could only think of spacemen (or space-women) as being divine regardless of whether the extraterrestrials, if they actually came, intended it or not. As for Moses, I do not recall reading anything about his being one of those “cross between the races.” However, just how many parallels are there to the story of Moses ascending Mt. Sinai and entering into a Covenant with God through the Ten Commandments carved in stone? Zoroaster’s mountain was bathed in fire when he heard the Revelation of God and was filled with mimic understanding as he descended to teach the Persians about Ahura-Mazda and his struggle with Augra Manyou – Good against Evil – and other mountain enlightenments (such as Hammurabi, Minos andMahomet). I do not know whether Moses, or anyone else, was the offspring of an earthling and an intelligence from outer space. Nor do I find it a challenge to my belief inGod as He encompasses the entire universe. Most countries have at least one sacred mountain associated with the manifestation of the Gods. The Hebrew “El Shaddai”(God Almighty) is reminiscent of the Syrian God Addu (Hadad) mentioned in the Armani Tablets. Ugaritic texts refer to El as sovereign, but another god ran things on earth for El as his vizier. That god’s name was Baal, a name quite familiar to anyone who has read the Old Testament. At Ugarit, Baal was known by several titles: “king of the gods,” “the Most High,” “Prince Baal” (baal zbl), and “the Rider on the Clouds” although the prophets would only give credit to Yahweh. The Sumerians equated God with Enlil; the Babylonians with Marduk. The Covenant between God and Abraham was paralleled by similar divine protection between Athena and Odysseus; Aphrodite and Anchises; Ishtar and Hattusili. Most ancient countries, and too many modern lands, believe themselves to be God’s “Chosen People”. So how does one date precisely, for example, the events of Exodus? In 1974, Josef F. Blumrich, a NASA engineer, wrote a book about the Spaceships of Ezekiel. Blumrich began his research with the attitude that Ezekiel (read 1:4-28, ‘The Vision of the Chariot of YHWH’), was all silly science fiction. Then, to hisutter amazement, he found that Ezekiel’s descriptive powers were so exact and soaccurate that he not only was able to reproduce his conception of what the ship looked like but, from a practical side, was able to get a U.S. patent on the wheels used on the spaceship described by Ezekiel. Until now, we have been referring to the Old Testament, other Religions, andLegends. What about the New Testament, written over a hundred years after Jesus Christ was crucified? Until the New Testament accounts, the story of Jesus was only by word of mouth. Try telling some of your friends a story about anything. Let it go around your circle for a few days and then get someone to tell you the story that you started. You may have a bit of trouble recognizing the original story with changes that have taken place as it was passed. One last point. We are a three dimensional intelligence with a limited realization of a fourth, generally accepted as time, which we use descriptively but cannot move back and forth in at will. (Remember the series, The Twilight Zone, 1959-1964?) It seemslogical there is a fourth dimension of intelligence with a realization of a fifth. You can keep on progressing, ad infinitum, until our finite minds become completely dizzy trying to grasp and comprehend things that are far beyond our current limitations. However, God encompasses all and He and He alone is the One capable of comprehending His reason for existence. Personally, I feel inadequate and limited by being a mere human to question His judgment. So immortality? Perhaps. Or, to quote Ralph Waldo Emerson, The blazing evidence of immortality is our dissatisfaction with any other solution. enlightenment. Very worthy read. Thanks you Patricia.